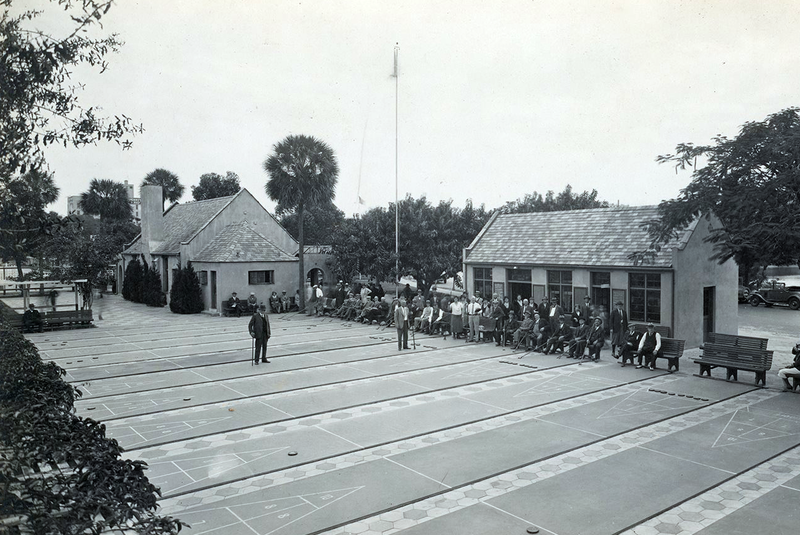 history of shuffleboard — and the St. Petersburg Shuffleboard Club — is told. Start with the court dimensions. 52 feet over all in length, 39 feet from baseline to baseline, and 6 feet wide, Those dimensions were standardized in 1928 when the four-year-old club realized that it was time to end the confusion of rules that varied from club to club across Florida. The St. Petersburg Shuffleboard Club, as the largest local club in the state, was in a unique position to do that; a club committee worked out a standardized set of rules that governed not only the play of the game but the specifications of disks and cues, and the dimensions of the court. Signs of local influence show up even in the jargon of the game: the center line running through the scoring triangles became informally known as Central Avenue, named for St. Petersburg's main street. The standardization of the game stands as one of the club's biggest achievements in the shuffleboard world. Pleasure games and serious competitions still rely on those rules and regulations today. But the history of the club is also a story of people and their coming together to create a community. And the rules are just a part of that story. If you can get three people together on a topic, you can start an association — or a club. And in January of 1924, that's what happened. 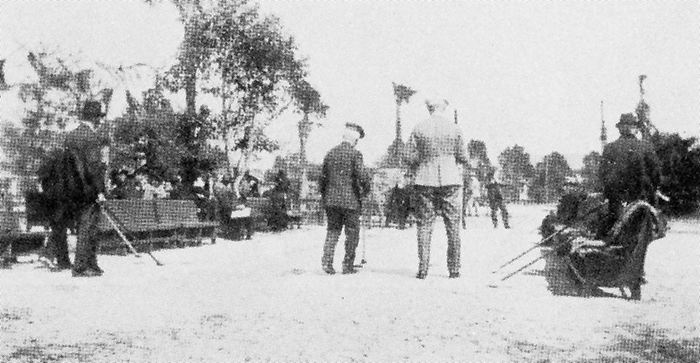 Shuffleboard had arrived in St. Petersburg in 1923. That year, Connecticut jeweler, Phineas T. Ives, visited St. Petersburg, where shuffleboard had yet to put down roots. He had played the game on the east coast of Florida, enjoyed it, and wanted to play more. He urged the city to build courts in Mirror Lake Park, and that fall two were built, right in front of where the clubhouse stands. 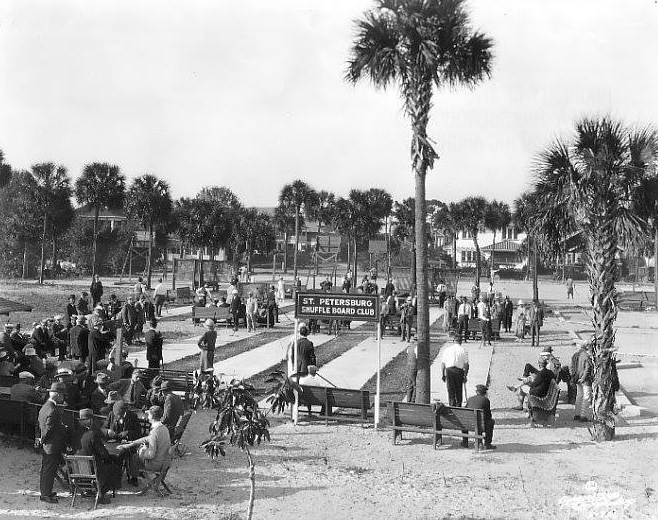 So in 1924 a group of shuffleboard players — six in this case — organized what they called the St. Petersburg Mirror Lake Park Shuffleboard Club, the first strictly shuffleboard club in the world; in time it became the largest club of its kind in the world. Shuffleboard at the club was a popular activity. That first season 426 members signed the club's roster. The daily match games were so popular that members were limited to one game. Expansion came quickly: the members contributed $60 to build another court, and the city built another one to bring the total up to four. Dues that first year were 25 cents, giving the club a treasury of $30 when the first season ended. After the second season began in November, the club bought fifty benches, fifty cues, and thirty sets of disks (two per set, compared to today's four), from the St. Petersburg Novelty Works. Then the weekly tournaments began, with winners receiving a ten-cent pin, which they had to give up if they lost. Clearly the two original courts were not enough, and later in the year another court was added at the members' own expense, and the city's park board matched that with yet another court. That early game was played with heavy wooden sticks and red or black wooden disks. The club's 247 members (at the end of that season on March 10); had paid dues of 25 cents apiece, and the club had a whopping $30 in its treasury, presumably after building the third court. In November of that year, at the start of the next shuffleboard season, — the second season — Kane was reelected president. More to the point, the club bought 50 benches, 50 cues, and 30 sets of disks from the St. Petersburg Novelty Works. Weekly tournaments began then, too. Winners got a ten cent pin, which they wore until they had to pass it along to the next winner. In 1925, the club sponsored its first float in the Festival of States parade. But that wasn't all: the club hosted the first All-States Festival of States tournament, won by Myrtilla Crities and Alex Willson, whose names were inscribed on a silver loving cup. The tournament was played under St. Petersburg Club rules, which had been drawn up by a committee headed by Phineas T. Ives. At the time, each club had its own set of rules, but later in the decade, the official rules for shuffleboard everywhere were written here at the club. Work started on the first clubhouse the next year. The club put up $11,000 toward the project, but the city, saying the club should have no interest in city property in the park, returned the check. The first section of the clubhouse was completed by October of 1927, at a final cost of a bit over $11,000, but it was January before the club moved in. The club furnished its new home, complete with fireplace, buying twenty-four card tables, a hundred folding chairs, sixteen smoking stands, a clock, and a drinking fountain. Membership grew rapidly that year. By the close of the season, the club had 2,588 members, and the demand for court time was so great that the city added more courts, bringing the total to 71. The club continued to grow through the rest of the 1920s. Membership reached 507 by the end of the 1927 season, 1,323 the next year, and 2,588 in 1929, paying dues of $3.00 that year. During those years, the club took a more prominent place in city activities, sponsoring a float in the March 1925 Festival of States Parade, as it has done since then, and holding its first All-States Festival of States tournament. The tournament, played under St. Petersburg club rules, drafted by a committee headed by P.T. Ives, was won by two people from Pennsylvania, and their names – Myrtilla Crites and Alex Willson – were inscribed on a silver loving cup. The membership growth of the Roaring Twenties continued into the Thirties, and the club progressed physically and institutionally as well. The clubhouse was expanded in 1931, old courts were replaced with modern cuts, and fourteen more were added. With 82 courts, 328 players could compete at one time. The membership roster that year listed people from 41 states (the largest number were from Florida), and two foreign countries – Canada was represented by four members in the club, and Scotland by one. And a complete set of cues and disks could be had from the Sunshine Lumber and Supply Company for $5.00.By the end of the 1932 season, the club boasted 3,050 members and 71 courts. In that season, too, the club had restructured itself as the St. Petersburg Shuffleboard Club, Inc., a 501c(7) nonprofit corporation. That year, the Florida Shuffleboard Association authorized creation of a National Shuffleboard Association, which in March held its first winter tournament at the club. In 1934, when the club celebrated its tenth anniversary, the city built sixteen terrazzo courts. The demand for courts and clubhouse facilities continued. Even the 1931 addition to the club building didn't keep up with growth. Plans were developed for another building on the site, to accommodate the bridge club and social gatherings. The addition was completed in 1937, and in November of 1938, some 2,000 members and guests gathered for the dedication and opening of the new clubhouse. That year, too, the fifteenth semi-annual national singles shuffleboard tournament was held at the club, with the biggest entry list in its history. In those days, shuffleboard, especially shuffleboard at the St. Petersburg Shuffleboard Club, had become a sport worth a newspaper's time and space. There was even a periodic column on the game and the club's activities. Even the writers of Florida: A Guide to the Sunshine State, published by the Federal Writers' Project in 1939, took notice. Mirror Lake Park was listed as one of the city's points of interest. It was, the guide said, the city's liveliest playground, and “headquarter for the St. Petersburg Shuffleboard Club, with 116 courts and more than 4,000 members.” A few pages before, the guide noted that the club's annual dues were $4. For the first year of the 1940s, shuffleboard and shufflers, as they liked to be called, continued to prosper. In 1941 the Florida Shuffleboard Association became the sanctioning body for all shuffleboard tournaments in state. But as 1941 ended and the United States entered World War II, tournament play began to decline. So did membership and activity at the club, and things wouldn't pick up again until later in the 1940s. But pick up they did, as life – and shuffleboard – returned to normal after the war. Throughout the 1950s and 1960s growth picked up. At the end of 1963 the club was predicting 5,000 or more members the next year. 1925. Photograph by Burgert Brothers. Courtesy Tampa-Hillsborough County Public Library System. The clubhouse (left) and the cue house are the original buildings at the club. 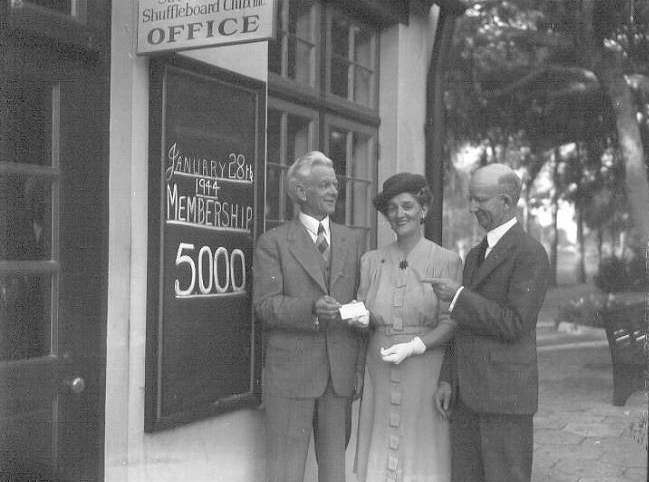 The club reached 5000 members in 1944. The 1960s and 1970s brought some needed repairs and maintenance to the club. Courts were rebuilt with concrete, and others were resurfaced. Buildings were painted and refurbished, and some new furnishings for the club house were bought. And in 1974, the club was fifty years old. Another forty years have passed, and the club has survived the challenges that any organization faces, including a 1972 proposal that the club be moved and the site turned into a parking lot for the downtown. That didn't happen, obviously. In fact, in 1994 the city's historic preservation office designated the club, its buildings and courts a historic landmark. Over the years, however, the rise and fall of the local economy, declines in membership, and even some neglect of the physical facility had a more noticeable impact. During its heyday, the club was more than a club for shuffleboard players. It was a community recreation center, where members could play bridge, watch movies, hold parties and dances. But its core remained shuffleboard players, and in time, the community centers and recreation centers, along with television, and the move to the suburbs drew people who weren't interested in shuffleboard away from the club. In 2005, however, a group of young artists, known as The Artillery, took up the game and joined forces with preservationists to host Friday night games. At the outset, about 35 members of the group would gather at the club on Friday nights, with friends and families, to play shuffleboard in a party mood, complete with music and food. The public was invited to play for free on Friday nights (members could play any time). The growing numbers drew renewed attention to the club and led to some $150,000 of repairs in 2008. Today with over 1200 members, the 90-year-old St. Petersburg Shuffleboard Club is strong in spirit. 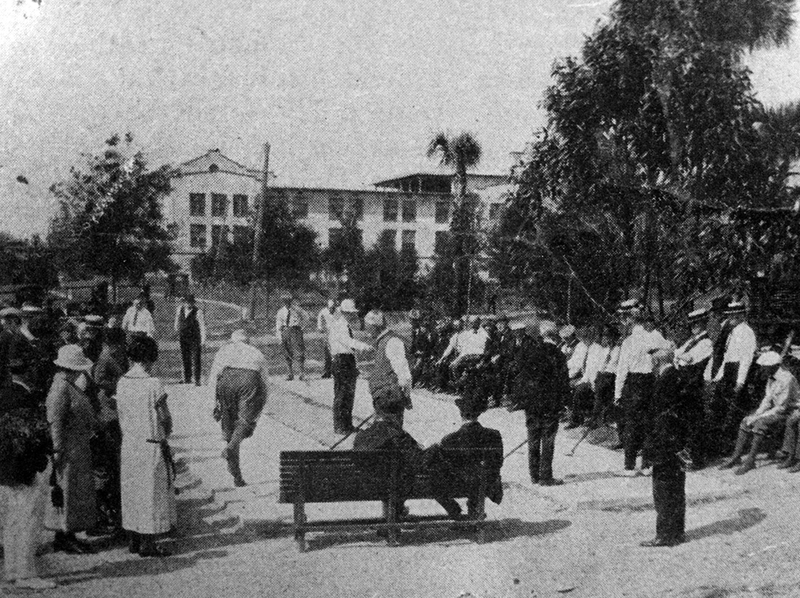 With younger people taking an interest in the club and the game, and the city taking a greater interest in the club and its courts, we look forward to another century of shuffleboard in Florida and St. Petersburg. Be a part of one of St. Petersburg's most historic organizations!